If the bombing had been pushed back a year, do you think the war would have lasted? If not, then you could make the case that Japan got nuked because this guy was trying to build a uranium light bulb. He advanced the bombing of Hiroshima by at least a year! This is a “now it can be told” story of wartime research. It started back in post World War I days when Dr. Harvey C. Rentschler, Director of Research for the Westinghouse Lamp Division, and Dr. J. W. Marden, an associate, decided to determine the melting point of a rare mineral . . . uranium. In his unending search for an improved electric lamp filament, Dr. Rentschler wanted to find out if uranium would give better service than tungsten. So Dr. Rentschler and his associates worked for about a year before they found a way to make pellets of pure uranium from which the melting point could be determined. Although uranium’s melting point made it unsatisfactory for a lamp filament, Westinghouse continued to supply tiny amounts of the precious metal to colleges and research laboratories for experiments in nuclear physics. (Little did they realize that their know-how would one day give America a head start in the race towards history’s grimmest goal!) For the most devastating war of all time had meanwhile blazed throughout the world—and scientists in many countries were feverishly trying to discover a method for unleashing the incredible energy concealed within the atom. Then, early in 1942, Dr. Rentschler received a telephone call. 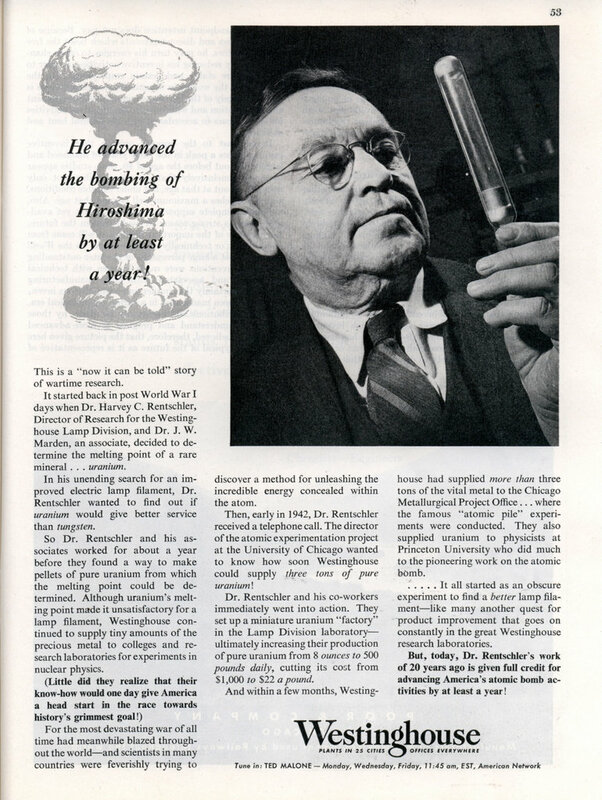 The director of the atomic experimentation project at the University of Chicago wanted to know how soon Westinghouse could supply three tons of pure uranium! Dr. Rentschler and his co-workers immediately went into action. 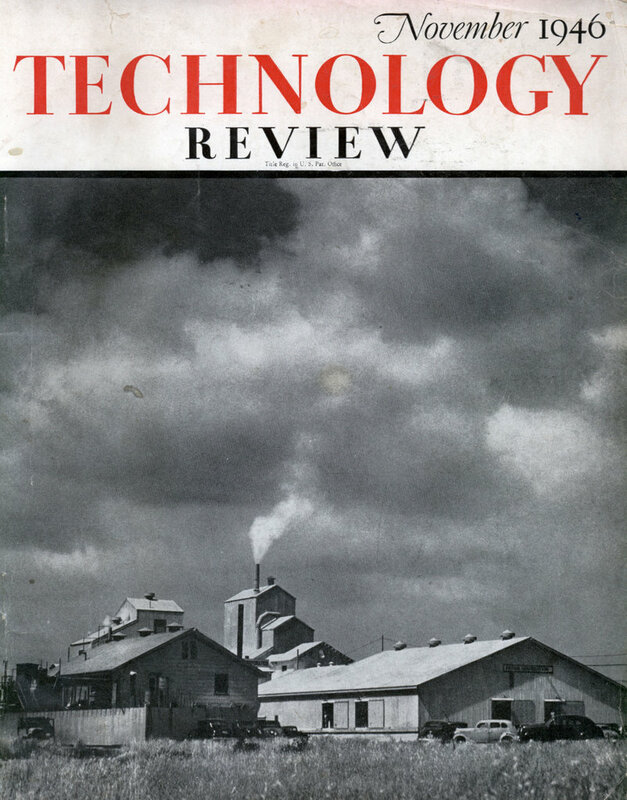 They set up a miniature uranium “factory” in the Lamp Division laboratory— ultimately increasing their production of pure uranium from 8 ounces to 500 pounds daily, cutting its cost from $ 1,000 to $22 a pound. And within a few months, Westing- house had supplied more than three tons of the vital metal to the Chicago Metallurgical Project Office… where the famous “atomic pile” experiments were conducted. They also supplied uranium to physicists at Princeton University who did much to the pioneering work on the atomic bomb. ….. It all started as an obscure experiment to find a better lamp filament—like many another quest for product improvement that goes on constantly in the great Westinghouse research laboratories. But, today, Dr. Rentschler’s work of 20 years ago is given full credit for advancing America’s atomic bomb activities by at least a year! The war was going to end one way or another. I still like the idea that we didn’t have to invade Japan. Seconded – Downfall/Olympic/Coronet would have been apocalyptic. I agree with FB and Z, operations Olympic and Cornet would have been far more horrific for both sides than dropping the bomb. I don’t focus on the means of what the A-bomb could and can do, at the time it was something big that went boom and stopped the Japanese empire in its tracks. I’ve also always believed that by demonstrating what atomic weapons could do, other nations may have been a lot less likely to release the genie later on. It was tough on Hiroshima and Nagasaki, but it wasn’t a picnic in Dresden or London or Shanghai either. At the time the A-Bomb was dropped my father and 3 of my uncles were in the midst of the preperations to invade Malaysia. An average of 10,000 people a day were dying in combat in Southeast Asia, China, and the Western Pacific. Japan had threatened to kill all POWs if the home islands were invaded. The atomic bombs did not end combat, nor did the emperor’s surrender message. Two large battles were fought after the surrender message, Kotou China and Kuril Islands. Yes, given the number of lives of American servicemen that were saved – and that America did not choose its war with Japan, but this war was the result of Japanese agression, it’s not surprising that the achievement of the atomic bomb by the Manhattan Project would be regarded as almost an unmixed blessing, even if it is “grim”, being a death-dealing weapon. It’s hardly ghoulish to want to survive and be free. It’s little know today that Japan also had a nuclear project. The REAL tragedy of “the bomb” was that there were several COMMUNISTS working at various tasks in the Manhatten Project and they reported EVERYTHING they could discover to their communist contacts. Uranium at $22 a pound? That’s less than Red Mercury! Er, KHarn, I think you mean there were several Soviet spies, though the only one at Manhattan I can think of was Klaus Fuchs. Communism is just a political system, it doesn’t automatically make you an agent of a foreign government. Thanks to the Venona intercepts we can appreciate the extent of Soviet espionage for that period https://www.cia.gov/lib… and beyond. Sounds like it went OK.